An aquarium is never complete without reproducing an ecosystem with the help of decorations such as rocks, shells, and, of course, plants. Many aquarists like to place plants according to the fish’s natural environment. Plants offer diverse species places to explore and hide, which is particularly a good thing for young fry to camouflage from larger fish. There are two types of plants for an aquarium: live plants and artificial plants (which can be made of plastic, silk, or other textiles). They all have their pros and cons and depending on your available time, dedication, and types of fish kept, determining which is best for you can be quite difficult. 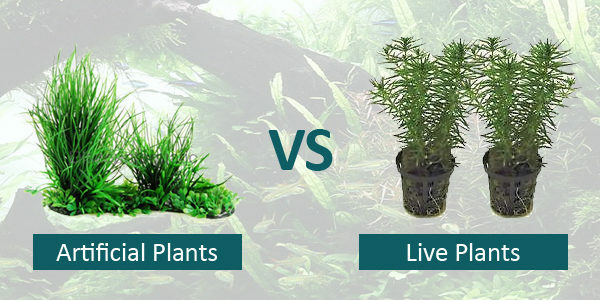 However, here are some of the advantages and disadvantages of both live and artificial aquarium plants. They are always the most natural choice for every ecosystem, which would help fish feel more at home in their tank. The vitality of live plants also brings an authentic encounter to your tank. Live plants take in carbon dioxide and help keep nitrate levels low, while releasing oxygen into the water, thus helping with the natural nutrient cycle. They can be considered a natural symbiotic. They filtrate other harmful substances and impede algae growth. They are continuously changing and growing, so you can have a new and fascinating image every day. Live aquarium plants provide an extra snack for fish that like to eat vegetables from time to time. Live plants require specific substrates and fertilizers, as well as more time to prune, thin, and/or trim. This makes live plants a bit harder to care for and maintain. Fish can nip at or even eat bits of plants, which can lead to more waste and filters being clogged by remnants. Some plants are even toxic for certain fish, so you have to be careful when matching them. Live plants can carry bacteria, parasites, or snails, especially if taken from another tank, which could cause diseases to develop and eventually effect the healthy environment of the aquarium. Live plants are also prone to decaying if living conditions are not suitable, so they can take up the oxygen in the water in the process of rotting. They require strong natural lighting, so choices are limited when placing your aquarium. Dark corners are not a suitable place for a planted aquarium. They are always ready to use and come in clean packages, so parasites or diseases are unlikely. They are less expensive than live plants and look almost the same. They even come in unusual and bright colors that can invigorate your aquarium. Artificial plants cannot be consumed or damaged by fish and will not decay, so filters will not clog and the plants can keep their shape for a longer time. They do not have any special environment requirements such as substrates, temperature, pH, fertilizing, etc., so they can be placed anywhere in the tank. They need less upkeep and are less time consuming as well as are easier to clean. Artificial aquarium plants can harm sensitive fish, especially plastic plants. Silk plants are more delicate, but you still have to be careful for the fish in your tank. They do not absorb nitrates and carbon dioxide in the water nor provide fish with oxygen, thus they have no biological value in the tank. Artificial plants do not inhibit algae growth, but they do not help with it either. They do not provide an alternative food source for the fish. Artificial aquarium plants are the preferred alternative by beginners for their first aquarium and some even continue the look for the entity of the aquarium. On the other side, live plants can help set up an entire ecosystem for your fish and other species such as shrimp or snails. Choosing the right plants for your aquarium can also be a matter of taste, besides maintenance and nourishment. Also, it depends on how much time you are willing to spend taking care of your aquarium and how healthy you want it to be. There are no right plants or wrong plants to use, just plants you consider the most appropriate for your aquarium. Which Plants are Right for Your Aquarium? When setting up a new tank. (beginner) What should go in first. Plants or fish. Definitely plants, Jim. And fish should only be introduce into the tank after the water has cycled fully which should take about 2 days on average.